Add a touch of sophisticated style and convenient storage to your home with this accent storage cabinet from the International Lux collection. Behind its unique bi-folding doors is a hidden storage area that contains four adjustable shelves. These four spacious shelves have the ability to move to different heights to give you flexible options to create space for items of all different sizes. These shelves are ideal for storing wine and cocktail glasses or board games and your collection of novels. It has room for it all! The large top surface also makes a great place to display picture frames, decorative plants, or even an accent lamp. This versatile cabinet adds beauty no matter where it stands in the living room, down the hallway, in the dining room or even in the entryway. Finished in Fossil Oak and detailed with gold hardware, this snazzy storage cabinet is sure to make a statement in your home. 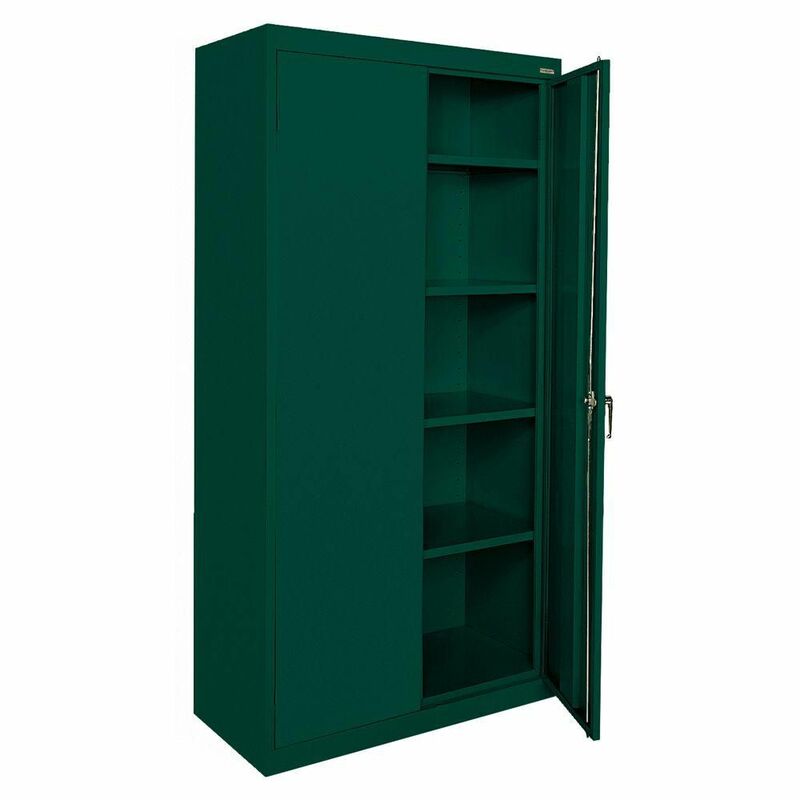 Classic Series 36 Inch W x 72 Inch H x 18 Inch D Storage Cabinet with Adjustable Shelves in Forest Green Great for the office or warehouse, this Classic Series garage cabinet provides secure storage for office products and other essentials. Features include four fully adjustable shelves on 2-inch centres, plus a raised bottom shelf, a three point door lock system and three sets of hinges per door. Classic Series 36 Inch W x 72 Inch H x 18 Inch D Storage Cabinet with Adjustable Shelves in Forest Green is rated 4.7 out of 5 by 6. Rated 5 out of 5 by gb from Great units, ordered two ready assembled and the locks were easy to put together . They were pack... Great units, ordered two ready assembled and the locks were easy to put together . They were packed very well and came faster than original date. Very heavy and well made. Rated 4 out of 5 by Critter from Just as described. Arrived in good shape. These usually come dented up from other suppliers, but this one was well cared for.